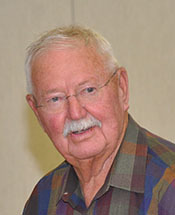 Sam Macdonald of Berthoud passed away at Pathway Hospice on December 5, 2012 at the age of 87. A memorial service will be held on December 13 at 2 p.m. at the Berthoud United Methodist Church. Ninth Street and Lake Avenue, Berthoud. In lieu of flowers, donations may be made to the Berthoud United Metodist Church Building Fund or Good Samaritan, 2101 So Garfield Avenue, Loveland, CO 80537.